Update: Out of Margo bracelets as of 5/15/13 early morning. Thanks again, generous readers! It’s the Comics Curmudgeon Spring 2013 Fundraiser! Contribute $15 or more to receive a copy of one of Josh’s favorite recent comic-strip panels, signed, matted, and suitable for framing. Thank you, generous readers! Action a-plenty in the midweek comics — let’s dive right in! 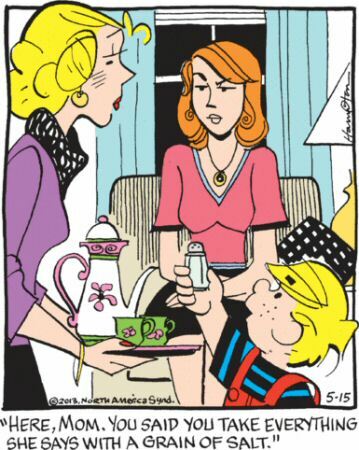 Pluggers, Jr. meets The Daily Jumble. As a plugger himself, dog-man is merely alarmed by his neighbors’ atrocious table manners. Out-of-town visitor parrot-man, on the other hand, is downright disgusted. Guy looks like he’s ready to KORF his ROPTAR all AELTP the RNCO — and that NIKAPN ain’t gonna help much. OK, is it me, is it cartoonists, or is the Bad Girl really always the hottest in the room? And we’re talking about a room shared with Alice Mitchell, so SRSLY! Dennis, cut the crap and pay some attention here — you won’t be 5 forever. Oh, ha ha — I forgot. You will be 5 forever. Kindly resume the crap. Payback time at the Morgans’. I hope Sarah has more success with her little project than June had with Rex.